Jose L. Part Jose L. Part | I am a PhD student at the Edinburgh Centre for Robotics. 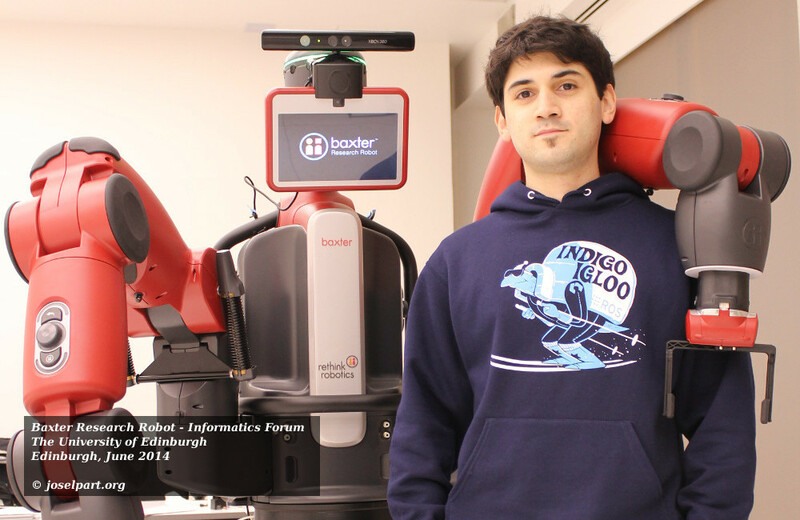 My current research interests revolve around teaching robots to operate among humans and in human-centred environments through situated interactive dialogue and demonstrations in a lifelong manner. This includes lifelong learning, hierarchical task learning, learning from demonstration and language grounding among other topics. I am a PhD student at the Centre for Doctoral Training in Robotics and Autonomous Systems, part of the Edinburgh Centre for Robotics. I am also a member of the HRI Lab and the Interaction Lab at Heriot-Watt University. Previously, I was awarded an Electronics Engineering degree by the National University of Rosario (Argentina), and an Erasmus Mundus Masters in Vision and Robotics (VIBOT) jointly awarded by the University of Burgundy (France), the University of Girona (Spain) and Heriot-Watt University (UK). I carried out my Masters thesis in the Institute of Perception, Action and Behaviour (IPAB) at the University of Edinburgh. I also hold a Masters in Robotics and Autonomous Systems awarded as part of my doctoral training. My current research interests include lifelong learning, situated interactive learning, hierarchical task learning, language grounding, learning through dialogue and visual demonstrations, interactive semantic mapping, and cognitive systems, but more importantly how to apply all these things to robots operating alongside people and in human-centred environments. Mar 2019 - I started running a reading group on planning and learning with Frank Broz at Heriot-Watt University. Feb 2019 - Our review paper on continual lifelong learning with neural networks has been published on Neural Networks. You can get a copy from here. Dec 2018 - I have started a part-time position as a research associate within the SoCoRo project at Heriot-Watt University. Feb 2018 - New review paper on continual lifelong learning with neural networks. Preprint already available on arXiv. December 2017 - We will be hosting our first local tournament of the European Robotics League - Service Robots from the 22nd to the 26th of January 2018 in our brand new test bed, part of the Edinburgh Centre for Robotics. More info here. November 2017 - The first edition of the Alexa Prize is now over. The winners were announced at the AWS re:Invent conference held in Las Vegas during the last week of November. Congratulations to Sounding Board, the team from the University of Washington! Read about it here. September 2017 - Our team has made it to the finals in the Amazon Alexa Prize!!! Read about it here! July 2017 - I'll be visiting the Institute for Artificial Intelligence at the University of Bremen during the second half of July. July 2017 - The semifinals period of the Amazon Alexa Prize has started! April 2017 - My team and I are going to be in Seattle at the end of the month for the Alexa Prize Summit. November 2016 - Our team has been selected as one of the 12 sponsored teams to participate in the Amazon Alexa Prize!! G. I. Parisi, R. Kemker, J. L. Part, C. Kanan and S. Wermter, Continual Lifelong Learning with Neural Networks: A Review, in Neural Networks, 2019. A. Vanzo, J. L. Part, Y. Yu, D. Nardi and O. Lemon, Incrementally Learning Semantic Attributes through Dialogue Interaction, in Proceedings of the 17th International Conference on Autonomous Agents and Multiagent Systems (AAMAS), Stockholm, Sweden, July 2018. J. L. Part and O. Lemon, Incremental Online Learning of Objects for Robots Operating in Real Environments, in Proceedings of the 7th Joint IEEE International Conference on Development and Learning and on Epigenetic Robotics (ICDL-EPIROB), Lisbon, Portugal, September 2017. J. L. Part and O. Lemon, Teaching Robots through Situated Interactive Dialogue and Visual Demonstrations, in Proceedings of the 26th International Joint Conference on Artificial Intelligence (IJCAI), Melbourne, Australia, August 2017. I. Papaioannou, A. Cercas Curry, J. L. Part, I. Shalyminov, X. Xu, Y. Yu, O. Dušek, V. Rieser and O. Lemon, An Ensemble Model with Ranking for Social Dialogue, in Workshop on Conversational AI at the Conference on Neural Information Processing Systems (NIPS), Long Beach, CA, USA, December 2017. J. L. Part and O. Lemon, Incremental On-Line Learning of Object Classes using a Combination of Self-Organizing Incremental Neural Networks and Deep Convolutional Neural Networks, in Workshop on Bio-inspired Social Robot Learning in Home Scenarios at the IEEE/RSJ International Conference on Intelligent Robots and Systems (IROS), Daejeon, Korea, October 2016. I. Papaioannou, A. Cercas Curry, J. L. Part, I. Shalyminov, X. Xu, Y. Yu, O. Dušek, V. Rieser and O. Lemon, Alana: Social Dialogue using an Ensemble Model and a Ranker trained on User Feedback, in Proceedings of the 1st Alexa Prize, Las Vegas, NV, USA, November 2017. © 2016-2019 Jose L. Part. All rights reserved.